Currently browsing articles with a topic of "largemouth". Ask any member of my family when they caught their first fish and you probably won’t get a straight answer. Why? Because our family fishing traditions run so deep that we were all too young to remember the first time we had a rod and reel in our hands. I know I was little because I have hazy memories of being on the boat with my dad before I was four years old. I don’t think that was when I caught my first fish though because I’m pretty sure (sniff) I was tying my own flies by that time. In all seriousness, I do remember making lures in elementary school because my third grade teacher punished my friend Curtis and I by keeping us in at recess when she caught us comparing patterns during spelling class. I remember my first trophy largemouth very well, a five-pounder caught on a crankbait when I was seven. 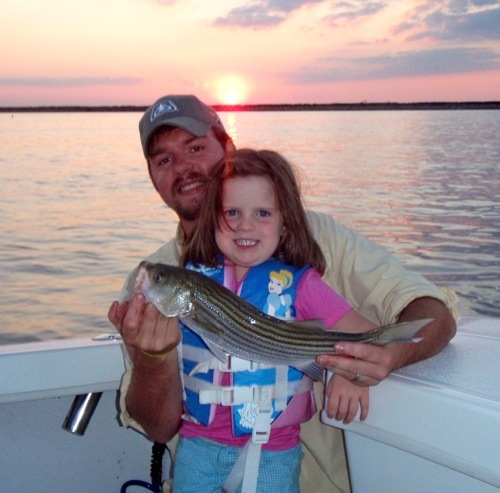 I can easily recall my first top-water rockfish even though I was only twelve. I also remember a lot of big fish that got away – I think those are the hardest to forget – but pinpointing that first fish is dern near impossible. This week my grand-kids are visiting from Tennessee and we’ve been making memories with a new generation of anglers. My son Daniel had some time off from his busy performance schedule. Since he was slated to take care of the kids while his wife attended an out-of-town wedding, he decided to drive north to Maryland. With my wife out of town as well, we were all set for a bachelor weekend with the younguns. Read More! 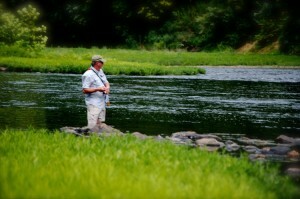 Almost all I know about fishing I first-learned by casting in mountain streams. Tactics like swimming a lure with the current, casting to the deep side of cover, matching the hatch, looking for the dark water, minimizing terminal tackle, and the importance of stealth are all stream fishing techniques that translate easily to fishing in the Chesapeake Bay. If you’ve followed CLT, you know that as much as I love the Bay and targeting the many species that live here, there are times when the call of the stream is so great that I have to drop everything and go. This past weekend my wife and I found ourselves with some time to kill en route to see friends and family near Jackson, Michigan. We stopped at several streams along the way, and I even got in some still-water pond fishing north of Lansing. Read More!